164 degrees on the equator is a surrealistic journey through the eyes of two talented young photographers Charles Negre & Thomas Rousset. Both making waves in the industry with their artistic flair. I met them at their launch event at the hip Études Studio in Paris. Our conversation started when one of the pictures caught my eye and peaked my Indonesia identifying radar. It parlayed into an interview with Charles over coffee; talking fiction, travel & painting a 7-meter tall tree in the middle of nowhere. C.N: you recognized that It was in Indonesia but you didn't know beforehand right? D: No, I had no idea that it was shot in Indonesia but I saw the images and it peaked my curiosity. That was why I approached you and Thomas to ask about the location of the shoot. D: So where did the idea of 164 degrees on the equator came from? C.N: Well the title came afterward. The basic idea is to create a fiction in a geographical context, the furthest possible. It was a coordinates of a location next to Indonesia in International waters, an imaginary island that belonged to no one, a fictional universe. C.N: We chose Indonesia because like in the movies, we wanted to choose a decor, and since in Indonesia there is everything, the ocean, the forest, volcano, all of it creates an amazing backdrop to create images. We chose Indonesia also because of the people; we knew that it was very easy to work with them and we have contacts there. So we went there because of all these reasons. Our starting point was the concept of fiction and we wanted to carefully prepare the stage. It was important to us that we can then expand to numerous countries all over the world. One thing for sure, there will always be these characters and a mysterious backdrop, for example, do you recognize this one? D: I was wondering about that, it's a game right? C.N: Yes! It was a game! People played it on the streets and those who lost had to pin all these drying clips on their ears, so the passerby on the street can see the person who was losing. It was a sort of humiliation for the loser. We saw that and we did the scene arrangements. The drying clip was a small thing but we took it to a bigger scale, It was always about an exaggerated detail, these little things became a little bit absurd when you modify it and, after the preparation is done, we followed our intuition. This was our daily cycle. D: Tell me more about this hat with the birdcage it looks very interesting having these 2 separate objects composed into one. C.N: All the images were carefully constructed, they were thought of in advance. We created objects to complement the images and then we moved on to setting the backdrop. There were hardly any images taken based on a whim. We always approached it as if we were creating a scene in a cinema. D: Where did you travel in Indonesia? C.N: We went to Jakarta, Yogyakarta, we stayed around a week there. We didn't have a smooth start with the project. D: really? Did you see the Komodo Dragons? C.N: Yes we did! it was so cool! D: We also went to Nusa Tenggara. Our goal was to go all the way to Kanawa Island but we weren't able to make it. D: How did you decide on this trajectory? C.N: We wanted to do half the trip crossing the islands and half the trip in an artist residency called Kersan Art Studio. It was a small art center in the village 5-10 minutes from Yogyakarta. Anyway, we often decided the duration of each stay on the spot. For example, when we were in Lombok we found lots of ideas so we stayed for 4 days and then we took off to a different place. D: What was your most memorable experience from your trip? It might not be the most eye-catching one, but it was the hardest one to do. We had to find a tree and painted it whole. it was 7 meters long, and it took 3 of us to do it. It was quite a feat! We put it in a smaller composition here, to invite the viewers to process a little bit more on what was happening in the picture. After the accident happened, we went back to Yogyakarta to the residency. Though it wasn't exactly what we planned, it ended well. We had our more structured studio photos there. It was our most creative moment. We had loads of fun, some the staff of the residence were our models and they were giggling all the way while doing the pictures, they didn't really understand what we were doing, but even us, we didn't know why we had these random ideas sometimes. C.N: It was the cake! We shot it on the last day. 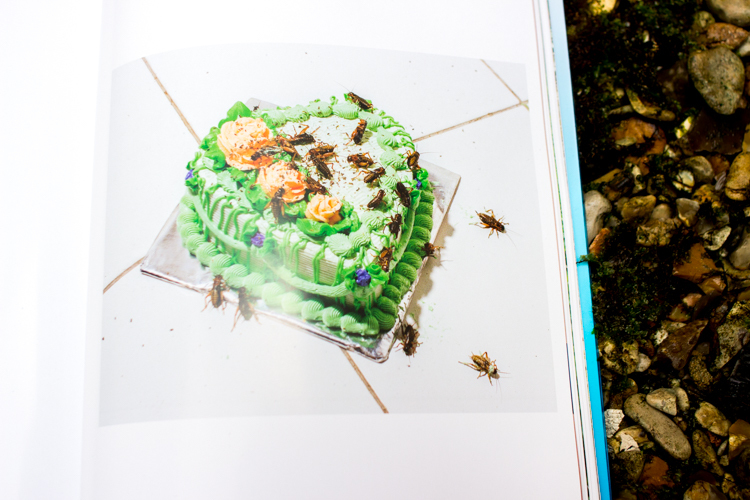 We bought the insects and the cake at the same time. You guys have the most awesome cakes. I tried to redo this image but I couldn't, nothing can beat that cake! Another cool thing was the small multicolor chicks! you don't really notice them in the beginning. D: I remembered them from my elementary school days, there were vendors that sold them in front of the school. D: What did you do with the objects that you created? C.N: We left almost all of it back in Indonesia, we only took the statues. D: Yeah! I recognize these traditional statues, normally it's in dark color and made out of wood right? C.N: Exactly! We sprayed them with motor paints that the youngsters in the village used, to create a contemporary effect. D: What kind of camera did you use for these images? C.N: We created all the pictures using an argentic camera within the time span of two months. We actually didn't see any of the images beforehand. It was when we returned to France and when we developed them that we discover all of it. So the book itself took shape a long time after that. Truth be told, it was the editing part that took the longest. D: How did you make the image selections at the end? He returned several times in different parts of the books it created a break and a rhythm. This was a vital point. If we were to do it all over again, I think that it had to be thought of from the beginning of the project. Like in a movie, there are several versions of the scenes, there is this main character that moved. It created a dynamic and add realism to the project. So if we were to do it again, we will create even more sequences. D: How was the collaboration process with Études studio? C.N: It was good, but a collaboration is always complicated, there were a lot of back and forth negotiation about what goes in the book, they wanted to control things and I do too, I had created a book sample with me, and it took all of us a year of discussion to realize the project. Thomas and I were actually surprised when we first got the book because there were a little bit more of the white pages than we expected but at the end, we are really happy with the result, and we think it showcased a good balance between both of our styles. D: So what is the next step? Translation : "For the only one who understood that it was in Indonesia"
C.N: For the next step, there are two possibilities, either we return to Indonesia for the second series or we embark on a different country.